Songwriter/lead singer Brandon Lancaster of Sony Music Nashville’s breakout band LANCO is earning his stripes in Music City songwriter circles as the sole lyricist behind the band’s hit, “Greatest Love Story.” It has been ten years since a country artist/writer has penned a chart topping hit alone. A look back in time to the early 2000’s reveals that the last artists able to make that claim are Taylor Swift (“Our Song”), Zac Brown (“Free”) and Jennifer Nettles’ (“Stay”). That success has propelled Lancaster to the No. One spot on the Top 60 Country Songwriters Chart last, based on streams, sales and airplay. Last week, the five piece group made their Grand Ole Opry debut during the ninth annual “Opry Goes Pink.” They received a standing ovation after offering up a performance of “Trouble Maker,” a medley of Alabama’s iconic hits “Dixieland Delight” and “Song of the South” along with “Greatest Love Story.” Adding to the band’s night of career firsts, LANCO was surprised with the news that “Greatest Love Story” has been certified gold by the RIAA for selling over 500,000 units, and it immediately shot to the No. One spot on the iTunes Country Chart as they walked offstage. “Greatest Love Story,” is also firmly holding its No. One spot on Shazam’s Country chart, while edging closer to the top of both the radio and sales charts. 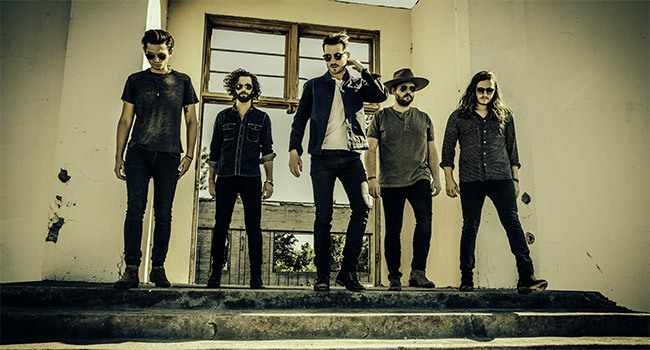 Named as “the band to watch” by Entertainment Weekly, Rolling Stone, Bobby Bones, Spotifyand more, LANCO gained their status from touring the country’s top festivals including Bonnaroo, Lollapalooza, Austin City Limits, Faster Horses and Watershed. As a native to the Nashville area, Lancaster’s truly authentic style has resonated with fans through the warm introductory of “Greatest Love Story:” one part classic, one part cutting edge and completely honest. As a co-writer on every song of LANCO’s self-titled debut EP, which can now count more than 60 million streams, Lancaster’s approach to honest country music storytelling is evident with songs that push the genre forward without losing sight of where it’s been. LANCO recently wrapped the recording process behind their debut album with award-winning producer Jay Joyce (Eric Church, Cage The Elephant, Little Big Town), which is slated for release early next year. Lancaster recently spoke with me via phone. In a nearly twenty minute interview, we spent the first ten minutes discussing “Greatest Love Story,” the first time I’ve ever spent that long discussing a song with an artist, but it was very informing. We also talked about the band and the upcoming full length album, due next year. You can read a portion below and listen to the entire interview at the end of this writing. “Greatest Love Story” has given you quite the success as an artist and songwriter. You’re now in an elite group of single-penned charting topping songs. Tell us what kind of history the song is making for you and what it’s meant to the group. How does it feel to say those words and to be living those words and to be living this experience? You wrote the song alone in your bedroom. What place where you in emotionally when you wrote it? What was the reason to put pen to paper there all by yourself? “I’ve been a songwriter for years and I know there’s industry standards of what a songwriter is and having a publishing deal, but I’ve been writing songs since I was like 12 years old, so I’ve never been afraid to sit down and start playing guitar and writing something that’s on my mind and on my heart. This song started out with me kind of reflecting on my relationship, and it started out with the first line of the song actually, ‘They said I was nothing but a troublemaker never up to no good. You were the perfect all American girl wouldn’t touch me even if you could,’ cuz that is kinda reflecting on my own relationship. If you come and see a lot of shows, you’ll see I’m a bit of a troublemaker. I jump into the crowd, I’m spraying beer cans, I’m jumping on the drumkit. We just have a lot of fun, you know, but I can be pretty rowdy at times. “My wife has always been, you know, she’s from Georgia. She’s just a blonde haired blue eyed all American girl, a little safer than I am. So people, I don’t think, would’ve ever ever put us together if they were gonna set people up, but I think we just balanced each other out. And thinking about the relationship and thinking about how well we balanced each other out we kinda fill the gaps.